What looks like a celestial butterfly here is actually the work of material from the red giant star L2 Puppis being shaped by a companion star into its gossamer state. The European Southern Observatory's Very Large Telescope in Chile captured this image. A cosmic butterfly of a nebula is undergoing a stunning metamorphosis in space, according to new images from a telescope in Chile. The celestial view, captured by the European Southern Observatory's Very Large Telescope, is actually the result of dust spit out of a dying star that is then shaped by a stellar companion to form what looks like a bipolar planetary nebula with symmetrical wings. ESO scientists also created a video view of the butterfly-like nebula to showcase the new images. The new ESO images are centered on L2 Puppis, an aging red giant star about 200 light-years from Earth. The star is surrounded by a disk of dust (viewed head-on in the photographs) that extends outward across 550 million miles, (900 million kilometers). Cones of dust form the beginnings of butterfly wings as they stretch out upward and downward, perpendicular to the disk, with curving plumes flying out through their centers. Its companion star, a younger red giant, orbits it very quickly, about once every few years. "The origin of bipolar planetary nebulae is one of the great classic problems of modern astrophysics, especially the question of how, exactly, stars return their valuable payload of metals back into space — an important process, because it is this material that will be used to produce later generations of planetary systems," study lead author Pierre Kervella, of Unidad Mixta Internacional Franco-Chilena de Astronomía in France said in a statement. "With the companion star orbiting L2 Puppis only every few years, we expect to see how the companion star shapes the red giant's disk. It will be possible to follow the evolution of the dust features around the star in real time — an extremely rare and exciting prospect." This image of the L2 Puppis "celestial butterfly" is built from visible and infrared observations of the Very Large Telescope to show the dust surrounding the red giant star. The new view of L2 Puppis is made even clearer by the Very Large Telescope's SPHERE instrument, which has a mode that enhances faint details that would normally be overshadowed by the bright star. The result is an image three times sharper than one from the Hubble Space Telescope which also helps build a 3D model of the structures based on how they polarize nearby light. Hubble has imaged many of these nebulas over the years, though never this young, and scientists have long puzzled over their orientation and formation: whether the dust is pressed inward or pulled outward by a companion into its distinctive shape. One theory suggests that the gas ejected by the dying star is pushed down into a disk shape by the emissions of the other star, and as the star sheds the rest of its atmosphere it is funneled outward through that ring in long plumes. This wide view image from the European Southern Observatory's Digital Sky Survey shows the region around the red giant star L2 Puppis, which is about 200 light-years from Earth. Another theory suggests that the companion star draws a lot of material away from the central star into a disk surrounding it and fast jets blast out from the center, carving out space in the surrounding dust cloud. 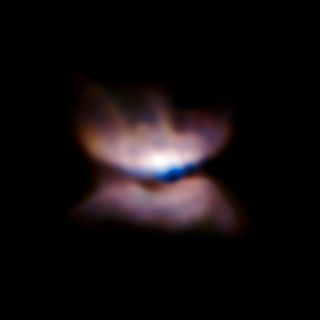 The system's appearance is consistent with both of those theories, and spotting it in this early form offers astronomers a unique opportunity to watch the butterfly bloom. You can follow staff writer Sarah Lewin on Twtter at @SarahExplains. Follow us @Spacedotcom, Facebook or Google+. Originally published on Space.com.